In this guide we’ll take a look at the best tree loppers for the UK market. What Are The Best Tree Loppers? In first place, the best tree loppers are these heavy duty loppers by Spear & Jackson. They can easily handle branches up to 5cm thick, all thanks to a clever ratchet mechanism that gradually cuts through. These long-handled loppers also double in size from 40cm to 80cm, which is of course helps you prune out of reach areas. The overriding consensus is that these branch loppers can ‘cut through virtually anything’, and after trying them myself, I couldn’t agree more! These Spear & Jackson Razorsharp Tree Loppers are the best tree loppers for the money! These Spear & Jackson W223 Razorsharp Tree Loppers, are great for cutting down hard-to-reach branches. 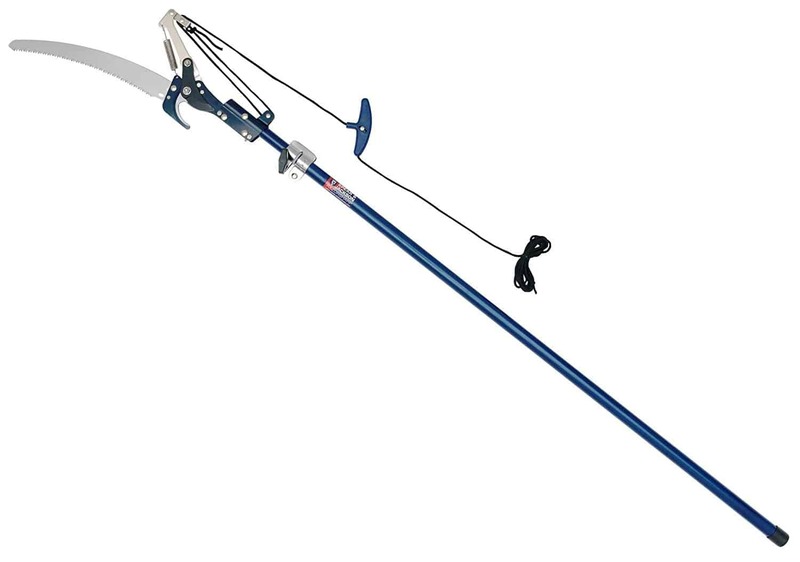 The telescopic handle can extend up to about 7.5 feet, meaning with your arms up it could reach almost 15 feet (depending on your height of course). On the end you’ll find an extremely sharp carbon steel blade, perfect for tackling an overgrown tree. If you are looking for a pair of the best loppers for hard-to-reach branches these might just be the ticket! If you don’t want something as heavy duty, but still super effective the next best alternative are these telescopic loppers by Spear & Jackson. They’re lighter and cheaper, and can easily cut through branches up to 4cm thick. These Spear & Jackson Razorsharp 18-30 Inch Telescopic Loppers are the perfect choice for the average British garden. If you want a pair of reliable and sharp tree loppers that cut cleanly every time, these Planted Perfect Pro Bypass Pruning Loppers are highly recommended. They easily cut through branches up to 2.5cm, making them great for bushes and small trees. They’ve also got a nice soft, grippy handle so your hands won’t take the brunt of continuous cutting! Reliable, good value, and top reviews. They get my vote. I’m also a big fan of these Fiskars FSK112590 Bypass Loppers. They’re very lightweight, yet extremely strong. These tree loppers can handle branches up to 4.5cm by incorporating a clever technology that lets you cut in one, or multiple steps if needed. They’re not telescopic, but at 70cm they’re certainly long enough to extend your reach quite considerably. What’s The Difference Between Bypass and Anvil Loppers? Very good question! Bypass loppers look and act in much the same way that scissors do, but tend to just have one blade that does the moving. You keep the loppers steady with your weaker hand, and with your stronger hand push down on the handle to move the blade and cut the branch. Anvil loppers on the other hand only have one blade which crushes the branch against a softer metal surface on the other side. The cut might not be as clean, but anvil loppers tend to be more capable of dealing with thicker material.